OK, I have made one previous minor attempt to chip away at my books. Today is another small step in that direction. I suppose it should be no surprise, given my profession, that I would have the hardest time shedding books. But the reality is: I have plenty of books on my shelves that I will never reread, and that I can’t imagine any of the kids ever picking up to read. Nor would I say that most of the books–tattered paperbacks–have any collectible value. With a move pending, I have a bit more motivation to let go of some of these titles, but it’s still a difficult task. 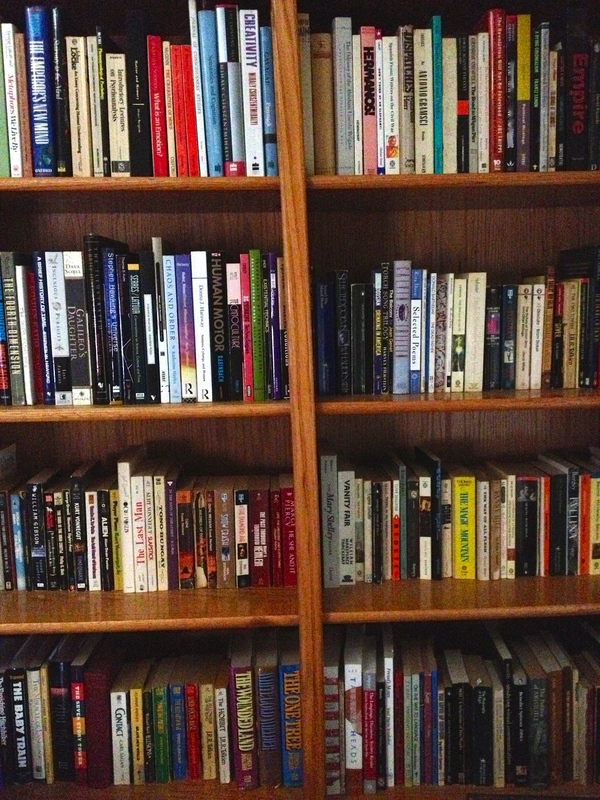 The root problem: books are fetish items for me–no, not that kind of fetish, but their material presence, stacked on shelves or piled on the floor, serves as a talisman of a sort–charms that strengthen and maintain that illusion I have of myself (and isn’t that what ego is?) as a well-read, educated, and cultured individual. But it’s just more stuff, really. So I continue to chip away at the books, using the same guideline as I did before: if I can’t fit them on the shelf, then they need to be donated to someone who has space and use for them. I tried to use that same standard of enduring value for holding onto the titles that I kept (or more accurately: if there was clearly no enduring value for a book, that was one I could toss). In the end, I packed up two heavy-duty, two handled paper shopping bags with books and sent them down to the basement to await their eventual donation. 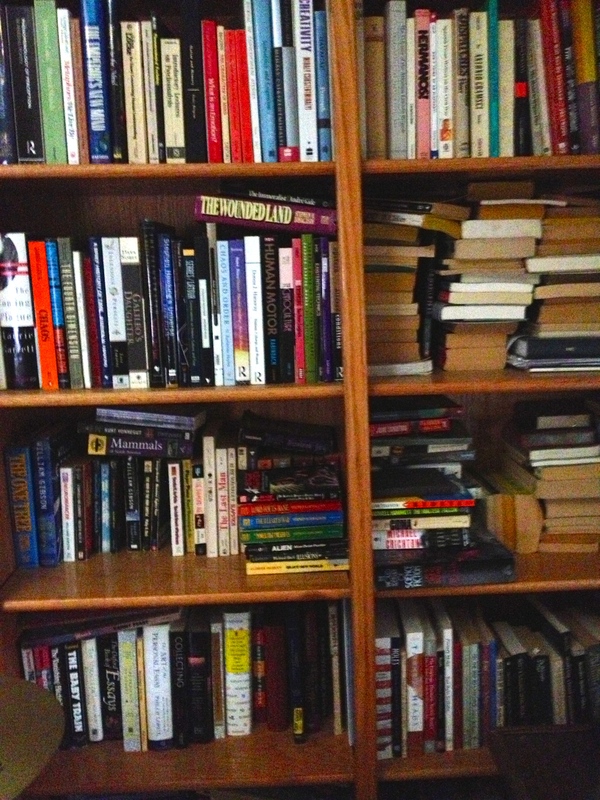 And yes, I did cheat–I couldn’t quite fit all the books that I wanted to keep onto these two sets of shelves, so a small handful–fewer than ten–joined the overflowing stacks of books on another set of shelves just to the left… and conveniently off camera. This entry was posted in Uncategorized and tagged abundance, clutter, ego, minimalism, reduce, simplify. Bookmark the permalink. But that is a huge step 🙂 I think it is amazing progress. Every time a few more and a few more. Terrific job! Yes, I definitely have to go at this one in waves…. The shelves look much better. I’m avoiding down sizing by having my husband build me more book shelves 🙂 Honestly I will downsize some and have more room to organize and showcase the ones I have. Back when I was trying to purge “archived” items in my inbox, I tried to focus on “decimating”–literally eliminating 1 in 10. That’s probably a good place to start. I wonder if I could do the opposite though: grab ten books and choose only one to keep. I don’t think I’m that brave…. It’s what I do! You just have to chip away at it, one book at the time and before you know it, suddenly you’ll have space in your bookshelf – well at least that’s what I keep telling myself, that I will at some stage, have some free space in my bookshelf 😉 good luck to you..
It’s the only way I can do it. I think I’ve found a good home for some of my 19th century English literature, so that should make the parting a little easier too. Great point! It helps that we will have almost no book shelves in the house we are going to be staying in for the next year. That means whatever I pack up will probably stay in a box for some time. And if it can live in a box for a year without me missing it… maybe I don’t need to keep it after all?